Five years ago, while sitting in my office during my lunch break at the Chinese university where I taught English, I started writing my first novel, THE AGE OF APOLLYON. Four months later, I finished it, and I realized that I had more stories to tell. 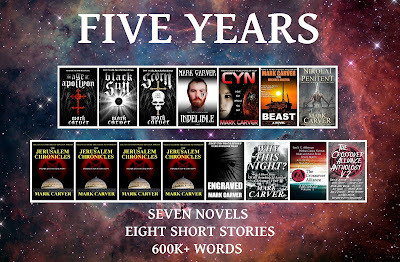 Five years later, I am now the proud author of seven published novels (and halfway through my eighth) and eight published short stories, totalling more than six hundred thousand words. During these five years, my wife and I have had two more children, moved three times (including moving from China to the USA), built a house from the ground up, changed jobs, and found ourselves busy with all of the hustle and bustle of suburban American life. My writing time is usually one or two hours at night, though I sometimes still write on my lunch break at the university where I now teach. I have self-published and signed with two small presses during these five years, and while I hardly make any money from my writing, my love of writing is what keeps my fingers tapping, not dreams of wealth and fame. I know I have many more stories left to tell, and while my pace may vary, I expect to have quite a catalog when I am done. I am especially thankful to God for this passion and I hope my writing honors Him.